Acting on the tip offs by the Deputy Chief Minister Sukhbir Badal, Chief of Damdami Taksal and the Sant Samaj, Baba Harnam Singh Dhumma has appealed the Sikh masses to oppose the ‘Sarbat Khalsa’ called at the outskirts of Amritsar on November 10. Demanding that the ‘Sarbat Khalsa’ be call be taken back, Baba Dhumma asserted that it can’t be held outside Sri Akal Takht Sahib. Baba Dhumma stated that anyone can call the Sarbat Khalsa however only Akal Takht Sahib was appropriate venue for the gathering. Strongly opposing the Giani Gurbachan Singh’s claims, he said that Akal Takht Jathedar doesn’t hold any value when he loses credibility in Sikh panth. He emphasized on the need to replace Takht Jathedars. Dhuma asserted that participation of all Sikh bodies from all over the world was necessary for the call of ‘Sarbat Khalsa’. Terming the United Akali Dal and Shiromani Akali Dal (Amritsar) as anti-Panthik forces, he alleged that the latter were hatching conspiracies to harm supremacy of Sri Akal Takht Sahib. Dhuma, also the head of Damdami Taksal, made it clear that the Samaj would keep away from the proposed Sarbat Khalsa at Chabba village on the outskirts of the city. The call has been given by a couple of radical Sikh groups, including Shiromani Akali Dal (Amritsar) and United Akali Dal. Stressing on the supremacy of the Akal Takht, Dhuma said he was not against the holding of Sarbat Khalsa but it should be held at the Akal Takht. Moreover, before calling a Sarbat Khalsa, a consensus within the Panth had to be built over the issues to be taken up, which the organisers had not done, he added. “You have to ensure the participation of all Panthic organisations and the Sikh ‘sangat’ across the world after forming a consensus on the agenda,” he added, while throwing light on the Sarbat Khalsas held at the Akal Takht in the past, including the one in 1920 that led to the formation of the Shiromani Gurdwara Parbandhak Committee (SGPC) and the SAD. He said the Damdami Taksal was behind the organisation of the last Sarbat Khalsa held at the Akal Takht on January 26, 1986, in which a number of important decisions were taken, including the one to rebuild the Akal Takht through ‘kar sewa’ by the Sikh ‘sangat’. Dhuma’s opposition to the event is on expected lines as the Sant Samaj over the years has sided with the SAD-BJP government on important Panthic issues. Moreover, deputy chief minister Sukhbir Singh Badal met Dhuma at Mehta Chowk on Wednesday and urged him to use his influence among Panthic groups to call off the event. He said the proposed gathering would undermine the tradition of Sarbat Khalsa and in future some groups might use it for gathering Sikhs and discussing Panthic issues. “There are some anti-Panthic elements which were hatching conspiracies to harm the Akal Takht and SGPC. We must counter such forces,” he suggested. He disagreed with Akal Takht jathedar Giani Gurbachan Singh that a Sarbat Khalsa could be called only by the jathedar in consultation with the heads of other Sikh Takhts. “If the Takht jathedars lose their credibility, the Khalsa Panth itself can call a Sarbat Khalsa,” he added. 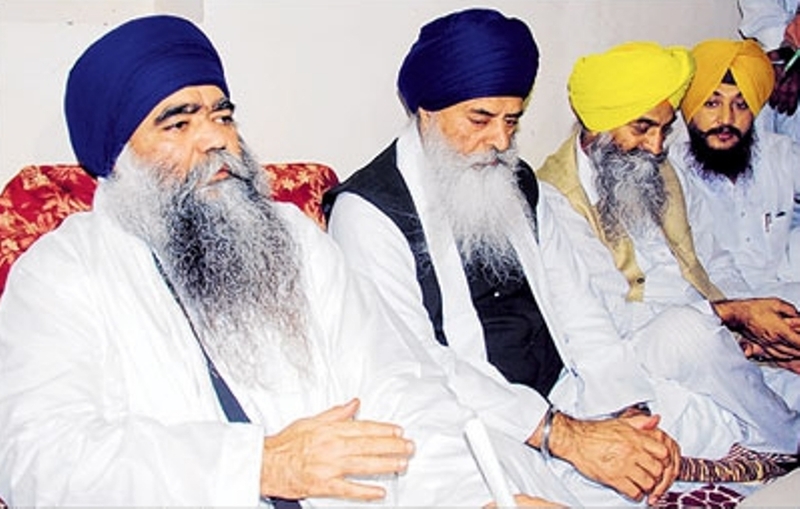 However, while toeing the government line on Sarbat Khalsa, the Sant Samaj leader did not approve of the decision of the ruling SAD to continue with the current jathedars of the Sikh Takhts, including Giani Gurbachan Singh, because of the manner in which they had pardoned the Sirsa dera head. “The jathedars of the Takhts who pardoned the dera head must be asked to quit or should be sacked. Acting jathedars can take their place,” he said. When asked about the threat issued by the Dal Khalsa and SAD (Panch Pardhani) of not allowing Giani Gurbachan Singh to make the customary address to the ‘quam’ on Diwali from the Golden Temple complex, Dhuma said he endorsed their view. “Giani Gurbachan Singh should not be allowed to address the ‘quam’ on Diwali. The SGPC can entrust this duty to the head granthi of Harmandar Sahib or any other senior granthi,” he suggested. Previous post Punjab Govt. Has Demanded 25 Companies Of The Para Military Forces From The Central Govt.